So. I’ve had BIGGER blonde moments. But deciding to post the August ‘stache glasses winner on a national holiday known best for bringing people to their computers to read blogs? Apparently these only make you LOOK smart. Nevertheless, you cheeky Chipmunks brightened my week with your uproarious entries for the latest Sun-Staches giveaway contest, where I asked you to submit memorable conversation bombs. You shared all KINDS of gems that, quite frankly, left me blushing on your behalf. Thank you. Normally I only choose one winner, but this time I couldn’t decide between two. 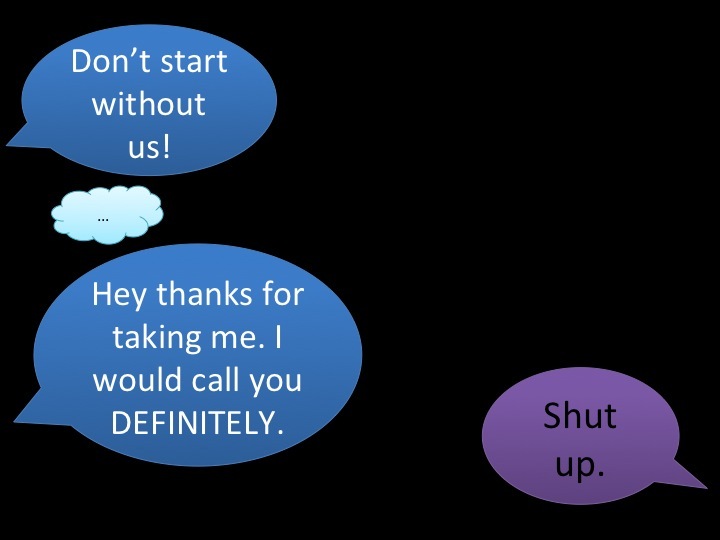 The first captures the true essence of a “WHAT did [s]he just say?” conversation bomb. #1 – Nicole from The Middlest Sister! By the way, if you’re not reading Nicole’s blog, you’re seriously missing out. Even the WordPress Editors recommend her blog on their short list, and for good reason. She makes absolutely amazing, handcrafted comics. #2 – mylifeisthebestlife at The Best Life! Congratulations Nicole and MLITBL! 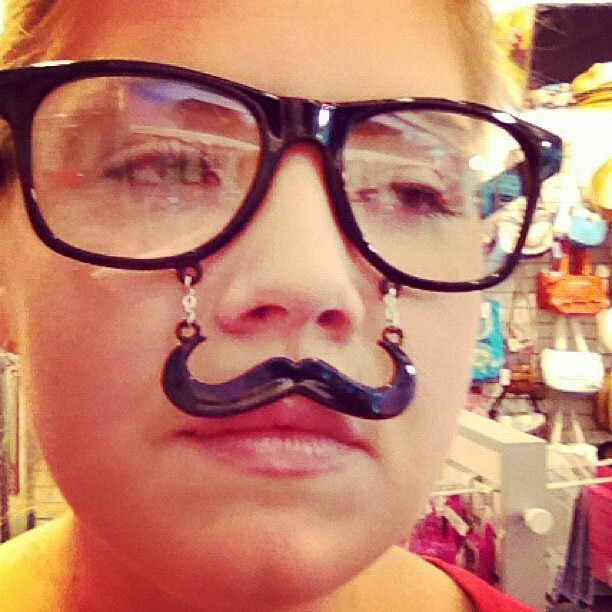 Email me your addresses and ‘stache glasses of choice and then get back to your Labor Day barbecue and booze! If you’re disappointed you didn’t win, I’m very sorry, but please don’t worry. We’re all winners on Wednesday, when I post the greatest thing I’ve ever done on Go Jules Go. …Wednesday’s not a holiday , is it? Previous postAre Your Parents Crazier Than Hers? Probably Not. An egg-shaker, a triangle, AND a Fisher Price xylophone?!? That video made my day. OMG Debbie, isn’t it the shiz?! 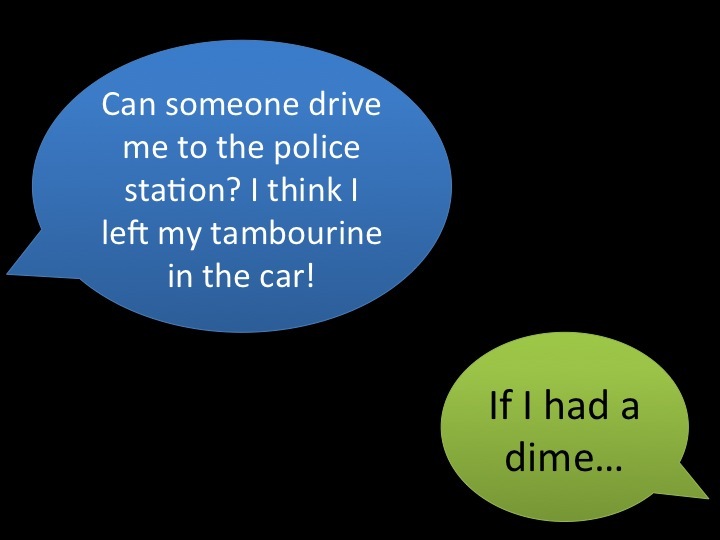 I was already dying to create a story around the tambourine conversation bomb, and then it hit me (but not the way Nicole’s former colleague thinks her husband hits her)! I was just watching it AGAIN; it never gets old. LOVE LOVE that video. I’m sending this to everyone at the office. And the melodica! Love it, love it! LOVE IT! Yea Louise! I am now picturing you rocking out to it with your ‘stache glasses on. Happy cookout and drink day!!!! Those are fab entries and very deserving winners. Congrats to them. That video is one of my favorites. Them just sitting around jamming to that popcorn bubblegum twee song is just so adorable. Not to mention Jimmy and his always adorableness. Thanks for the reminder. Thanks, Misty! This contest was SOOO hard to judge – I swear my ‘finalists’ list was 10 deep! And I’m usually really good at narrowing it down. When I first saw that performance on Jimmy Fallon, it reminded me of what true happiness is. I feel so fulfilled now that it’s linked on my blog. Thanks, Lilykins! I had some Bacardi yesterday and thought of you. I keep dying my hair lighter in the hopes that it will explain everything. I was hoping you would post every day this weekend, because in case you haven’t heard, I don’t have a life either. Pep says you’re the best thing he’s ever done. I’ve seen the billboard. Did you like how it lit up? I didn’t even know billboards did that. It’s all coup d’oeil…it shimmers in day light but once it’s pitch dark, that effect doesn’t work. Maybe for your 40th? Huzzah! So glad I checked my emails today! PS- Where is everyone getting these Freshly Pressed buttons? They didn’t give me one! Nof air! It’s a new widget. Anyone can get it. Even if you were never FP’d, right Jules? Congrats, Nicki! And you better get your button up there! I wonder if anyone can get that button, or if it only “magically” appears in your widgets list if you qualify? Congrats Nicki – I’m truly happy (jealous) that your oh, so deserving (not as good as mine) entry won! Congrats, Nicki!!! I can’t even THINK about your entry without laughing. Thanks for such a great one. One day you’ll have to tell me more about this board member. Your ‘stache glasses have been ordered! I want a coloured xylophone with wheels… and a Quest-love… but I bet Quest-loves eat a lot. This is going to turn out just like that time when I was six and I asked for a puppy, isn’t it? But damn if I don’t still want that American Girl Samantha doll. I had not already viewed the masterpiece. I bought a walk-man the other year because I never got one when I asked for one. The funny thing was that it was only ten dollars and I actually need it for a french class. My professor was a dinosaur apparently… which makes me wonder why we didn’t get along better…? This comment may seem weirdly out of place… but it really isn’t. I promise. Jules, I don’t know what day of the week this is so you are all right by me. and I don’t know which posts of yours are real anymore, Angie. I am just stunned. Taken aback. Shocked. Your post today made me feel like the moment I realized Milli Vanilli was really a sham. Wha??? Milli Vanilli – not a gangsta? the video was so cool. How I wish Jimmy and The Roots would sing with me, I’d even play the little xylophone. 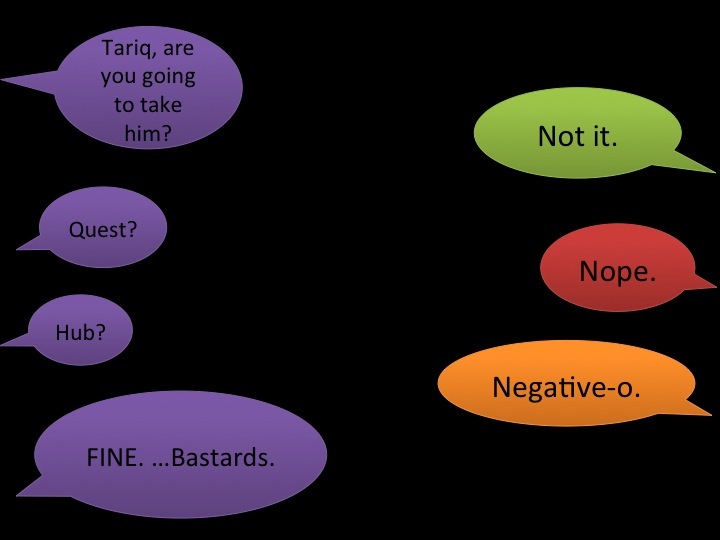 So, could I BE any more behind on comments?! Holy chipmunks! I think I’d play ‘armpit farts’ if it meant I got to jam with Jimmy and The Roots. You have NO IDEA how high I jumped and how hard I clapped when I saw this. It’s like all my dreams came true all at once. And I’m sooooooooo excited for whatever you’re going to do on Wednesday…. WOOOOOT!!!!!! I want you to know I’ve been celebrating your victory for WEEKS!! I’m actually really tired. Well get yourself some Red Bull or meth or whatever it is you crazy Americans use to put some pep in your step and KEEP ON DANCING! Because this party has JUST BEGUN!!! I’m going to class it up with Coke and coke. but then when I do that I always forget what I am going to do. =/ I rock. A lot. And then sometimes you don’t realize you even missed your exit until you notice that the sun is rising behind you, and realize that means you are going west when you should be going East. Well, 20 lashes for you. I am on top of every single blog and blog comment, as you can see. *sigh* I hope you’ve learned from this.